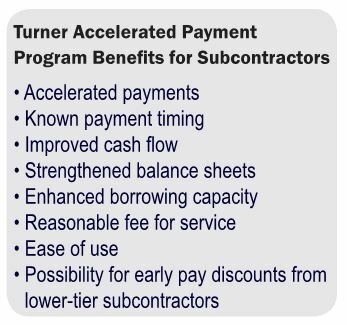 Turner Construction Company has worked closely with Textura Corporation and Greensill Capital to develop the Turner Accelerated Payment Program™, which provides subcontractors the opportunity to receive accelerated payments thereby improving their cash flow and strengthening their balance sheets. Controller, Delaware Glass & Mirror Co.
1. A subcontractor enrolls (easy, one-click) in the Turner Accelerated Payment Program™ online via Textura CPM. 2. Turner reviews the subcontractor’s monthly invoice and submits it to the client. 3. Upon client approval of the invoice, Turner authorizes the accelerated payment to the subcontractor prior to Turner receiving payment from the client. Retainage and other amounts, if any, can be withheld from an accelerated payment according to the subcontractor’s agreement. 4. In consideration of the accelerated payment service, the subcontractor pays a nominal fee, which is disclosed and agreed upon at the time of enrollment. The fee covers the interest expense, the cost of operating the payment financing facility, and the risks of delayed payment to Turner. Q: Why is Turner offering this program? A: It expands our service offerings and it increases the financial strength of our subcontractors. Subcontractors can use the accelerated payment to fund work in progress and use their working capital to enhance their business. Q: How quickly will I be paid? A: It is our expectation that subcontractors will be paid within five days of pay application approval by the client. Q: How does the program affect my existing asset-backed loans or other debt facilities? A: The accelerated payment made to you in return for a fee is not a loan and is therefore not a debt. Q: What fees will I be charged to receive my accelerated payment? A: To preserve the non-debt accounting treatment for accelerated payments, Turner is not permitted to discuss the fee with its subcontractors. The fee will be presented to you through the Textura CPM application when you enroll in the program. Q: How is the fee determined and can it change during the project? A: The fee is determined by Greensill Capital and takes into account factors such as the market cost of borrowing, the repayment risk of Turner, and the number of days between the subcontractor payment and when Turner is paid by the client. • Base rates (LIBOR is the benchmark in the US) could move up or down, for example in response to changes by the Fed in its Target Federal Funds Rate, which would affect interest costs for all borrowers. • Investors’ view of Turner’s credit risk could change. That said, Turner’s credit rating has been stable for many years. • Turner may revise the number of days used in the fee calculation to reflect the payment behavior of the client. In the event that the fee for a particular subcontractor and/or project must be revised, the subcontractor will be notified via Textura CPM. Q: Why might my fee be different from one Turner project to another? A: A fee is unique to a project. Different projects may have different fees, which may change over time based on the market factors and scenarios outlined above. Q: What happens if, after I have been paid early via the program, the Owner is late in remitting payment to Turner? A: Turner is absorbing the late payment risk, so there is no impact on the subcontractors. Q: Is the fee charged to enrolled subcontractors, regardless of whether or not they meet all requirements to receive an accelerated payment? A: No, the fee will only be charged if an accelerated payment is made. Q: Will lien waivers, releases, etc. be handled differently if we use the program? A: Lien waivers and releases will still be required prior to payment just as they are today. Early payment will not be made if there is a failure to fulfill all such conditions precedent by the time the client approves the invoice (you will receive a non-accelerated payment per the normal contract terms and the accelerated payment program fee will not be charged). Q: Will retention payments be accelerated? A: Once the release of retention has been approved by the client, then the retention payments will be processed through the Turner Accelerated Payment Program in the same way as any other invoice. 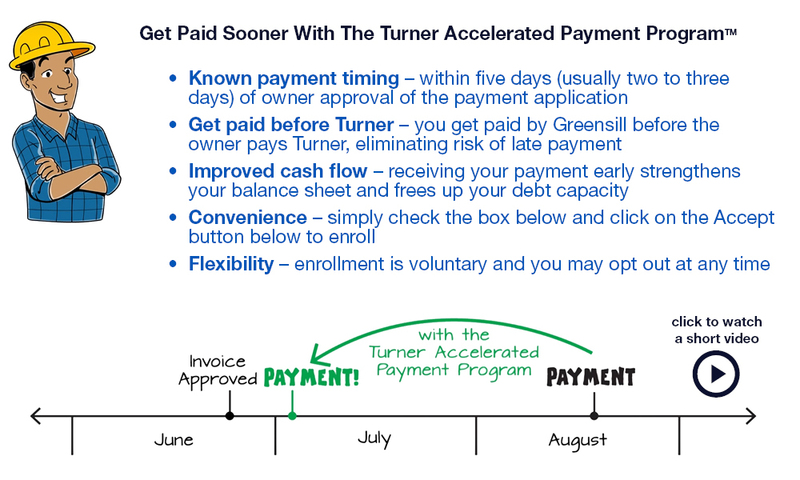 The Turner Accelerated Payment Program will not accelerate retention payments ahead of client approval. Q: Do I have to always use the program once I start? A: You can un-enroll and re-enroll at any time, or use the program for select projects. However, we have offered the program with the expectation that subcontractors will adopt and use it consistently on all their Turner projects. Q: Do I have to sign an agreement with a financial institution? A: No. You must simply accept the terms and conditions on the Textura platform when you enroll in the program. Q: Do I have to install any software or use a new technology platform? A: The program is offered via the same Textura CPM platform you use today. Q: How will my day-to-day Textura CPM experience change? A: The Textura CPM experience will be the same except for the addition of the program enrollment screen. Q: How will I know if an accelerated payment has been made? A: You will be notified through Textura CPM when a payment has been made. Textura CPM will also track and store your previous payments.